Förstberg Ling got invited and subsequently won a competition for an apartment building in Stockholm in the spring of 2018. The small plot in Nacka Strand is situated in the corner of a sloping green park, with an unobstructed view towards the sea. The municipality’s detailed development plan stipulated a fixed, angular building envelope, the use of wood in the facade, and to replace lost greenery from the park within the project. The seven­-storey building includes a lower volume facing the street, two floors embedded in the slope, and two penthouse floors set back from the main volume. The irregular shape was divided into a grid of heavy columns and thick slabs extending through the facade, forming continuous ribbons of balconies. The site’s proximity to the sea called for a more durable material for surfaces exposed to the environment, which is why concrete is used for the balconies. 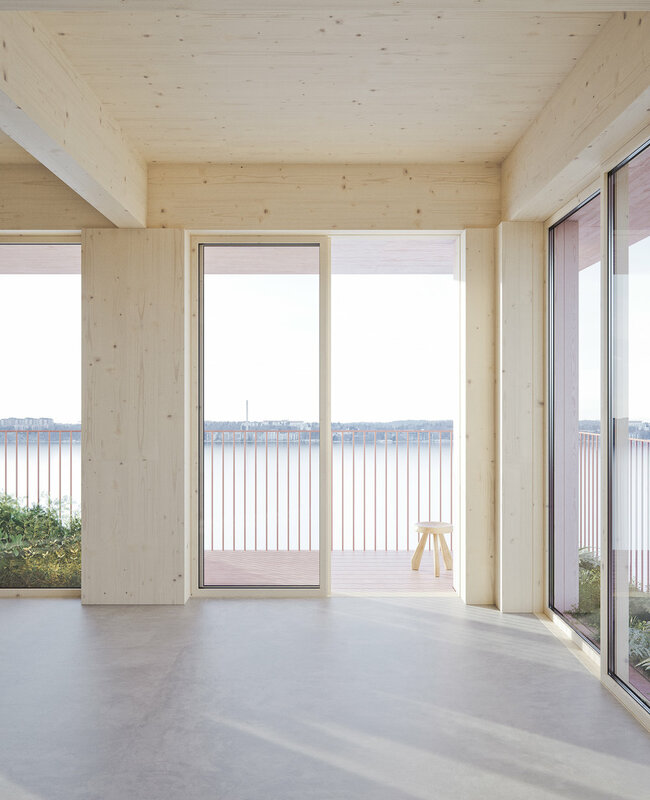 The concrete is cast with a rough plank structure, echoing the wooden facade, with both materials also coloured in the same hue, a light pink. To replace the green from the park, the balconies also functions as big planters, with parts of them filled with soil and an integrated irrigation system providing each of the twelve apartments with its own garden.